Cats have never been, nor ever will be, domestic servants. It just goes against their very nature. 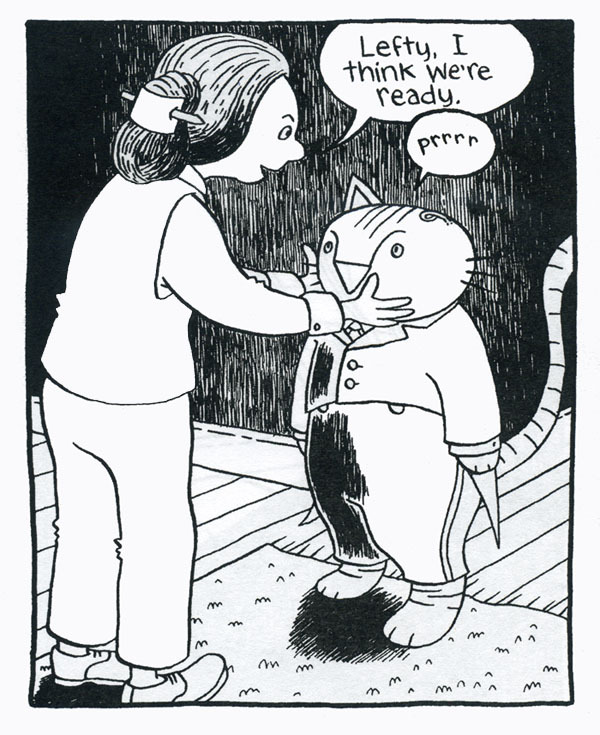 However, in Megan Kelso’s new minicomic, “Cats in Service,” she makes a strong case for it. Of course, it’s not simple. There are complications. Megan Kelso has a wonderfully determined style that goes back to her earliest minicomic, Girlhero. Her characters have a directness to them, with eyes that stare back. Objects and backgrounds are lined up with purpose. No one minces words in a Kelso comic. Usually we have something off-kilter that needs to be righted. The cats in this comic have definitely nailed the Kelso stare, all enigmatic and mysterious. How do you ever get a cat to do anything that it didn’t want to do in the first place? That’s the mystery here as you have all these cats in the roles of maids, butlers, nannies, and cooks in the service of a family who has abruptly inherited them. Through the magic of comics, we get quite an amusing and spooky tale. Are these cats really doing what they look like they’re doing? Are they making dinner, making beds, and mopping the floors? And, if so, why? It’s a question that these cats may be asking themselves as well. A man, woman, and child adopt a crew of cat servants. Pretty strange. The cats appear capable of anything, even expressing love, to some degree. But they can’t speak. And, ultimately, they remain utterly unknowable. Amid all the cats, Kelso gives us a story of a family. It is Carol’s older sister, Prudy, who owned all the cats. And it was Prudy who dutifully looked after Carol and made some sacrifices in order to act as a good mother after their parents died in an accident. In short, Prudy became a crazy old cat lady. But she seemed to love it. And when the cats came to live with Carol and her husband, David, and daughter, Sarah, it looked like the cat servants had a new home. But does one dynamic ever really work in a new setting? And, once you let a new thing into the privacy of your own home, are you ready for it to uncoil and fully take up residence? Kelso provides us with a tale that sparks with whimsy, suspense, and wry observations on the secret life of families. 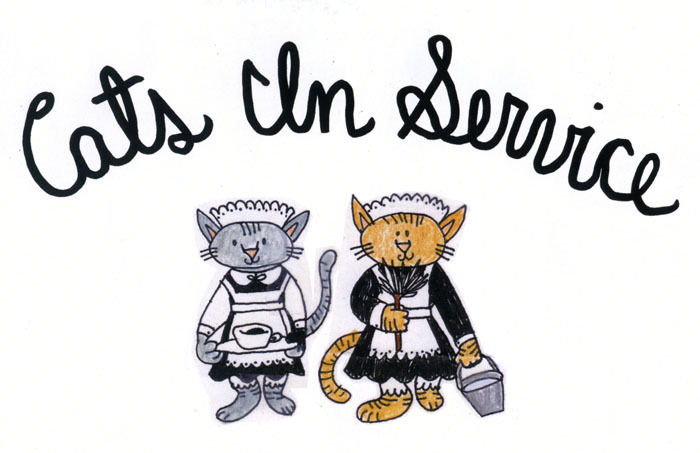 “Cats in Service” is a minicomic, a format that you typically can find at a comic arts festival. This particular minicomic was recently available at the Jet City Comic Show and at Short Run Comix and Arts Festival. You can purchase it through Spit and a Half which you can find here.